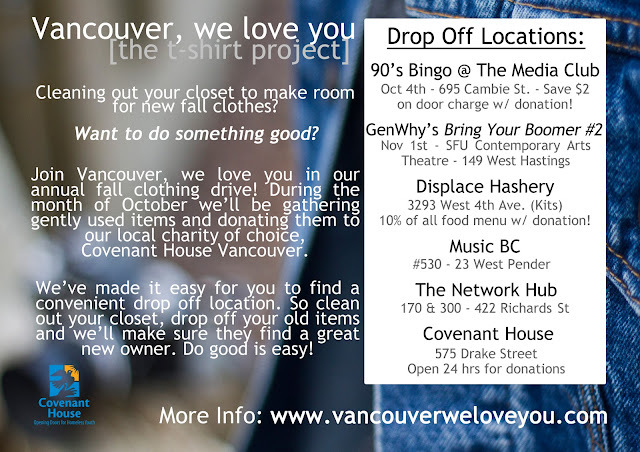 Join Our Annual Clothing Drive For Covenant House! We are extremely fortunate to live in one of the most wonderful cities in the world and chances are if you're reading this post that you have a roof over your head, food in your fridge, and a warm bed to sleep in tonight. You probably also have a couple of hoodies, sweaters, jeans, and jackets in your closet that you haven't worn in a while. Why not do something good with those items and donate them to Covenant House to pass on to the street youth they help in our city? We know you're busy and have a lot going on, so we've made it super easy too. Besides being able to drop off your donations at Covenant House 24hrs a day any day of the week, we've also found some amazingly supportive businesses and events across the city to partner with us and sign up as drop off locations. Some are even giving you deals for bringing in your gently used clothing! Check out the full listing of drop off locations and event details by clicking "Read More." A huge thank you to all the businesses and people that are helping us do a little good around our city. Because really, it's too easy not to. It just makes sense. 90's Bingo at The Media Club (695 Cambie St.) - Head to The Media Club on October 4th for Big Shiny 90's Bingo! 90's music, all you can play bingo, nostalgic prizes, and the ultimate 90's trivia. $10 gets you in, a drink, and all the bingo you can play. Bring your clothing donations to receive $2 off the door charge! Gen Why's Bring Your Boomer #2 at SFU's Contemporary Arts Theatre (149 West Hastings) - The Gen Why Media Project is at it again with another fantastic event for young people that are already, or looking to become, engaged with their community and the issues surrounding them. Check out the Bring Your Boomer #2 event November 1st and make sure to bring your used clothes to donate! Displace Hashery (3293 West 4th) - Great food, great drinks, and great staff. Bring your clothing donations to Displace Hashery and receive 10% off your food bill! The Network Hub (3rd Floor, 422 Richards St.) - The Network Hub is a great communal office work space that provides co-working space, private offices, shared offices, shared mailbox, and meeting room rentals. Stop by with your donations and check out their fantastic set up! Music BC (#530 - 23 West Pender St.) - Music BC provides information, education, funding, advocacy, awareness, and networking opportunities to BC musicians. If you're a musician looking to further your career or connect with people in the music industry stop by their office (with a donation of course!) and say hi.